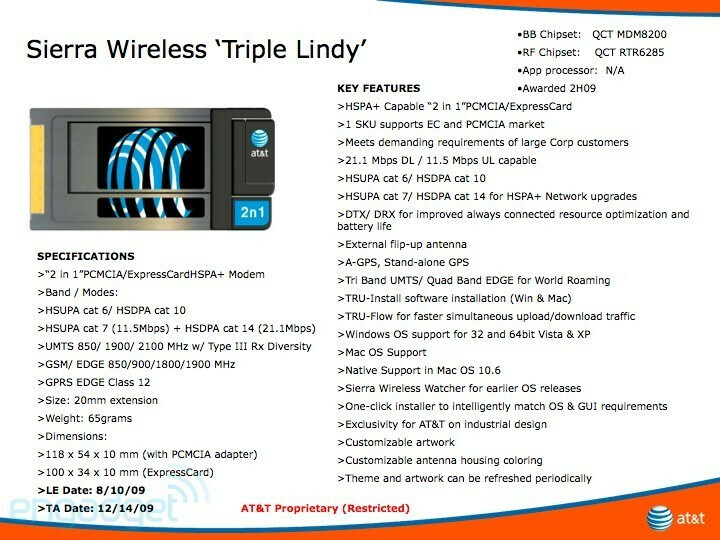 It seems these AT&T leaks just won’t end. 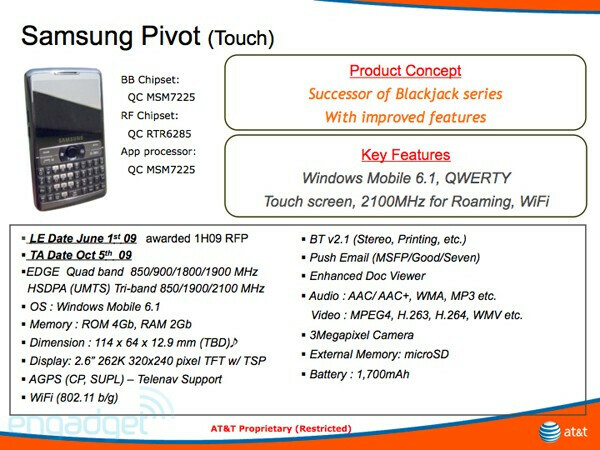 This time we have a QWERTY candybar - the Samsung Pivot. It looks like successor to the Epix, bringing out 2.6-inch touch-sensitive display, 3MP camera, Wi-Fi, aGPS, global 3G, giant 1700mAh battery and… 2GB RAM and 4 GB ROM, which sounds too... unrealistic. The indicated release date is October 5 and the OS seems to be WM 6.1, but if it´s to come out at the end of the year, we would rather stick to the 6.5 theory. 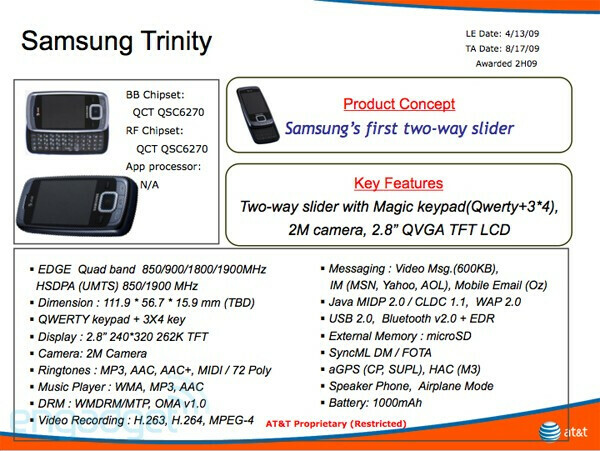 Another phone from Samsung is also rumored to be released this year – the Trinity. It is expected to be the Samsung’s first two-way slider, allowing for both a standard numeric keypad and a side-sliding QWERTY. This one will go for its place in history with a 2.8-inch QVGA screen, 2MP camera, aGPS and a dual-band UMTS. If you like that, look for it from August 17 onwards, as this is what the leaked document says, though we cannot be sure if the launch takes place on that exact date. Next up, we have a little something from Pantech – the Pantech Aladdin. This exotic name perfectly suits the extravagant color scheme and shape of the phone. The Aladdin is a slider with a keypad, which, once opened, reveals a full QWERTY keyboard. It also features a horizontal 2.2-inch screen, 1.3MP camera, aGPS and global 3G. This phone should come out sometime around August 17 as well. In the end, it turns out that AT&T also has plans for releasing some data cards. 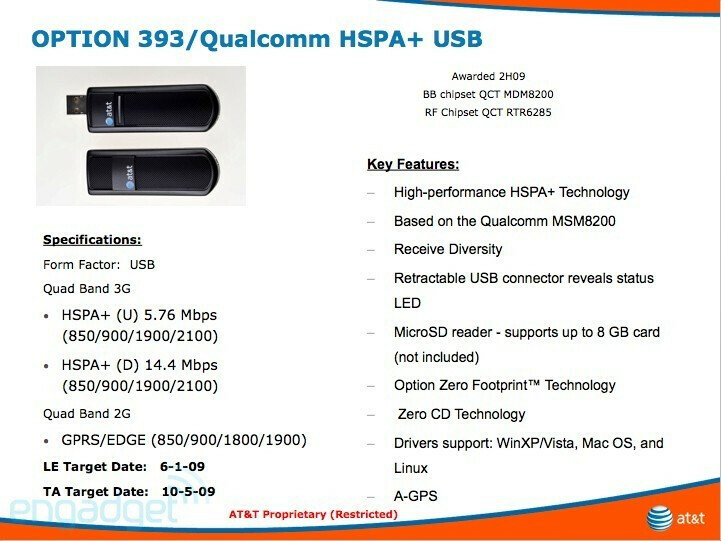 Pictured are the Option 393, which is also going to have an integrated microSD slot, and the Sierra Wireless “Triple Lindy” that seems to be a lot more feature-packed. For more details on these, as well as the above-mentioned phones, check the pictures. at&t has been really heating up with all their phones!! Im kinda surprised ATT would try to launch so many phones. I know these aren't for sure, but if most of these are true, ATT may have the best variety of phones. Its gonna be a good summer. ya it is, and if they keep doing buy one get one free deals with all the new devices like they have with them impression and the xenon then it will be an even better summer.. So many phones for AT&T... Can't wait to upgrade if all this stuff comes out. The Pivot kinda seems more like an Epix successor in my opinion. 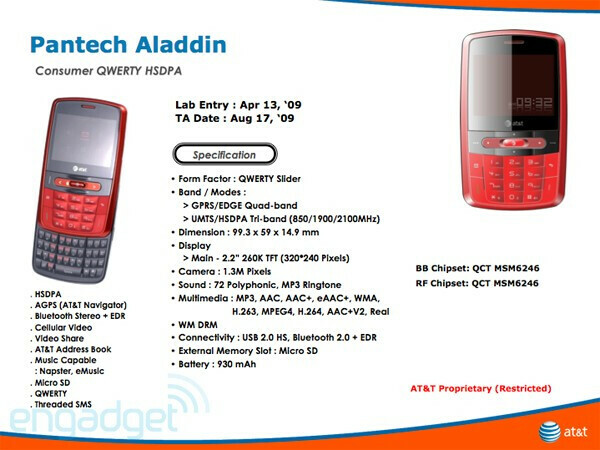 And that Pantech Aladdin is uggggggggggggggly!! !